This weeks stitch was requested by one of my YouTube friends. 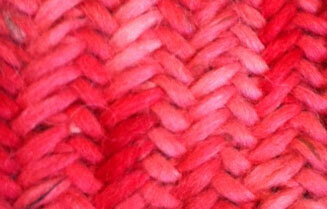 If you like this stitch, try the Little Herringbone Stitch. Here is a video for knitting this stitch in the round. There are a number of stitches named herringbone. Some look like the one above, some do not. I used the Twice Knit Knitting method to do this weeks stitch, and the instructions below are also in Barbara Walker's Second Treasury as I have them below. She calls it Double Stockinette or Little Herringbone stitch. This particular method creates a very dense fabric, so you should use a larger needle than called for on your ball band. Even a lighter weight yarn will yield a fairly dense fabric when knit with larger needles. Row 1: K2tog through the back loop - drop only the first stitch from the left needle, the second stitch should remain on left needle. Knit next two stitches through the back loop, dropping only the first stitch from left needle as before. Continue working in this manner to last stitch, Knit one as normal. Row 2: P2tog, dropping only the first stitch from left needle. Purl next two stitches together, dropping only first stitch as before. Continue working in this manner to last stitch, Purl one as normal. Thanks so much for doing this. Can't wait to try. thanks for your great blog and youtube.. we can now appreciate knitting and doing more interesting stitch thanks to you... when are you going to teach s some project to do with these stitch? Hi Muriel! While I do offer patterns from time to time, the main purpose of this blog is just to show everyone how to do the stitches, and then they can use the stitches to create whatever they like. Love your videos, thanks so much! To do this in the round, would I just do row 1, or maybe a regular K2 through the front loops? I was absolutely in love with this stich when I discovered it in summer. Even with the heat I started a scarf :) And you make it sooo easy to learn - thank you!! I would love to do a beanie with this stitch but wonder how to make reductions? Could you help with that? !